Hi Everyone!! Hope you're having a good day today! I am playing phone tag with my surgeon. I am hoping to get some answers. I really need some relief from this pain; I want to see results. Now, for those of you that do not know what is going on you will find everything in the post here Medical Issues. Here we are in December and this pain is constant and still just as excruciating as it was in October. I really would like a pain free Christmas. I contacted the surgeon again. He was out of the office. He has a hectic day tomorrow, but his nurse is going to try and get in touch with him letting him know I am looking for an update on what our next step is. I also contacted my primary physician to see if my surgeon contacted him. He is also out of the office at this point. He will be in tomorrow and will be phoning me back. I have had a difficult time getting into my craft things. I really want to get back to doing what I love. I love making cards, gifts and just about anything with crafting. Give me something to alter so I can make it new in a new way. Now on to the project at hand. I needed a birthday card. I wanted it cute too since it is December I decided to make it a little on the Christmas side of things. I used CCR for the designing of the base of the card. I then did another layer for the front of the card with patterned paper. I then did the other layers of the stocking in a contrasting color. I then wanted an adorable face and what better to use, but Peachy Keen Stamps. I used one of my favorite cartridges from Cricut; that is Simply Charmed. This project is also in the Project Center on Cricut. You can see it here. Hope you enjoy! Have fun! There are many fun projects on there. I am hoping to get some of the other fun things I have in store for you up here soon. 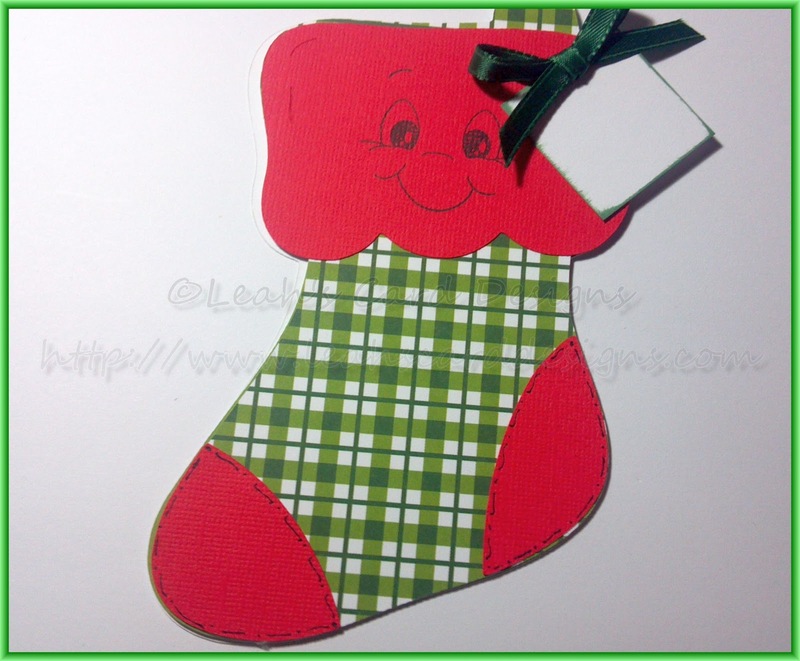 I will take some pics of the cute adorable stockings I made for the children at my son's school. I will leave you guessing with another project that I'm making. Hint 1 - It is round Hint - This is for a special place in the house. Now that I have you guessing I will now get back to trying to find a comfortable position. I will update when I can. Thank you so much!!! Very cute! I hope you are pain free and well very soon. It's difficult to be unwell at any time but especially during holidays. Super Duper Cute!Hope you feel better.